By this point you should have a populated SharePoint List. Now you need to create a web page that will be used to display the Google Map, and the data used to generate the map. Type in a name for the page and select a layout template that you want to use. I used the ‘Full Page, Vertical’ layout. Then click on ‘Create’. Go to the Document Library where you created the new web page. Select the page that you’ve just created and click on the ‘arrow’ to open the drop down menu. Select ‘Edit in Microsoft SharePoint Designer’. The page will then open in SharePoint Designer. The image below shows a page that I’ve opened, showing the ‘Design’ mode. Click inside the body of the page, it’ll highlight the placeholder, then click on ‘Insert’ and then ‘DataView’ in the Ribbon. 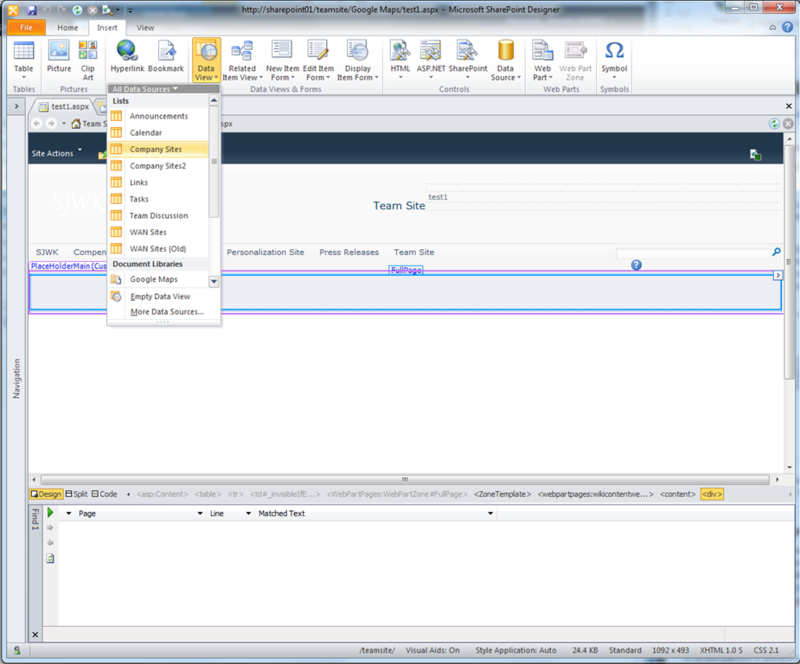 A drop down will appear listing the various SharePoint Lists. Select the one you’ve created previously, in my case, as shown in the picture below, ‘Company Sites’. The SharePoint List will then be displayed on the page, something like that shown below. Now ‘Save’ the page and exit SharePoint Designer. 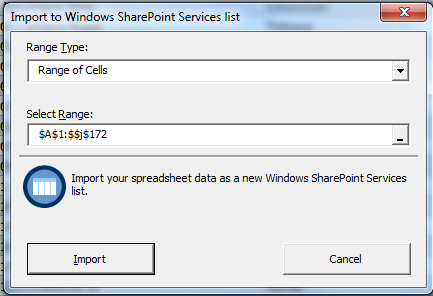 You can either create a custom SharePoint List and manually enter the data or use an Excel file to create and populate the List. 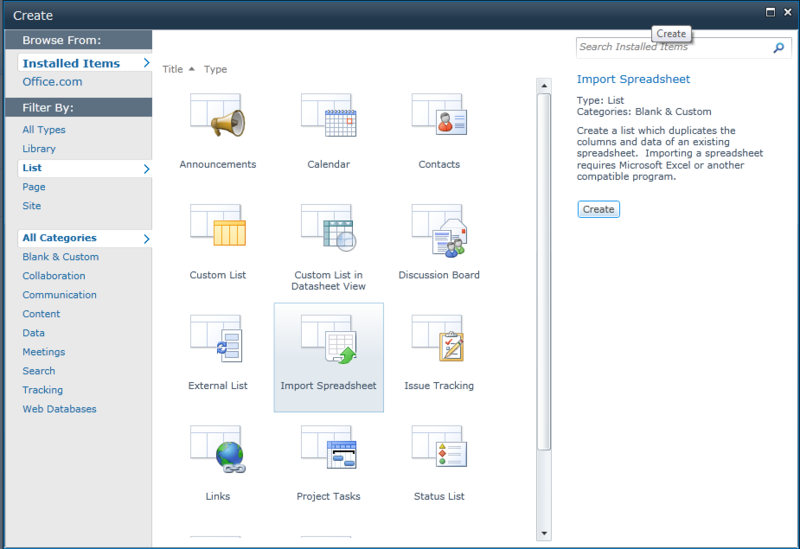 The next three pictures depict various screens used to create a SharePoint List from an Excel Spreadsheet. The picture below shows the various fields for my List, along with the field type. I’d also suggest at this time that you create a second view of the data, with a limited number of rows of data displayed. his will help during trouble shooting. If you have lots of data then each entry will be processed. By limiting the number of rows displayed we limit the number being processed. You could if you want just modify the default view to limit the number of items but I found it easier to have to separate views. The default ‘All Items’ view contains an auto-generated column that we don’t need need so we’ll modify it to exclude it. On the Ribbon select ‘List’ and then ‘List Settings’. Scroll to the bottom of the page and click on ‘All Items’, under the ‘Views’ heading. The ‘Columns’ section should be auto expanded, if not expand it. The first column listed should be ‘Attachments’. Uncheck the box next to it’s name and then click on ‘OK’. Select the SharePoint List for which you want to create a new view. On the Ribbon select ‘List’ and then ‘List Settings’. Scroll to the bottom of the page and click on ‘Create view’. At the bottom of the page under the heading ‘Start from an existing view’ select All Items’. In the resulting dialog box type in a name for the view. I used ‘5 Records’. Scroll down to the bottom of the page and expand the section ‘Item Limit’. Set the ‘Number of items to display:’ to 5 and select the ‘Limit the total number of items …….’ radio button. Then select ‘OK’. You should then have a new view something like that shown below. Note! Replace the ‘<insert your own Google Maps API key here>’ with your own Google Maps API key. These can be obtained from Sign Up for the Google Maps API.